According to the United States Census Bureau, the city has a total area of 3.69 square miles (9.56 km2), of which, 3.60 square miles (9.32 km2) is land and 0.09 square miles (0.23 km2) is water. Lindstrom is located 10 miles from the Wisconsin state line, and less than two hours from cities including Duluth, St. Cloud, and the Twin Cities area. When looking at the town from above, it looks like it could be an island due to the surrounding lakes. 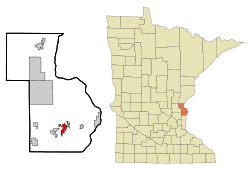 Lindstrom, officially spelled Lindström, is a city in Chisago County, Minnesota, United States, located 35 miles northeast of the Twin Cities. The population was 4,442 at the 2010 census. Lindstrom’s motto is America’s Little Sweden. U.S. Highway 8 serves as a main route for the community. In 1853, Daniel Lindström left Sweden in search of a nice piece of land to settle in America. Lindström was platted in 1880. The town of Lindstrom was incorporated in 1894. Many other Swedish emigrants traveled with Daniel Lindström. Joris Per Anderson, half brother to Daniel Lindström, came in 1850 leading a party from Hassela, Sweden. In the party was Erik Norelius, whose personal journals in part formed the basis of Vilhelm Moberg’s novels of the Swedish emigration to the United States, The Emigrants. Moberg’s novels have two main characters, Karl Oskar and Kristina Nilsson. The novels depict the hardships Swedish emigrants endured en route to America. A bronze statue of the author, holding his bicycle as if ready to ride away, stands on a stepped platform in Chisago City’s town park. An image of Karl Oskar and Kristina remains Lindström’s logo today. Since 1990, anyone who has taken U.S. Highway 8 from north of Forest Lake to Lindstrom has driven on the Moberg Trail. Lindström celebrates Karl Oskar and Kristina annually with Karl Oskar Days. This event takes place mid-July and includes such activities as the coronation of a “Karl Oskar Princess”, parades, a street dance, and fireworks. There are still statues of Karl Oskar and Kristina in Lindström, as a tribute to the early Swedish immigrants whose descendants continue to populate the area. These statues are the main attraction for tourists from all over the world who come to Lindström because of its Swedish heritage. Lindstrom was settled predominantly by Swedish immigrants and their families. In April 2015, Minnesota Governor Mark Dayton signed an executive order to restore the “umlauts” over the “o” on the Lindström city limits sign. The sign will now match the spelling on the sign that officially welcomes you to the town. Lindstrom is part of the Chisago Lakes School District #2144. There are five schools in the area, which accommodate around 3,600 students in grades K-12. The five schools in the district include Primary School (Grades K-2), Lakeside School (Grades 3-5), Taylors Falls Elementary (Grades K-5), Chisago Lakes Middle School (Grades 6-8), and Chisago Lakes High School (Grades 9-12).